Mirela, originally uploaded by Marius Popovici. Here’s my cocktail dress based on the Malissa pattern for the contest at BurdaStyle. My inspiration came from the raglan cut and the fabrics I had in my stash. I eliminated the sleeves and collar and really kept it simple. I cut out the front and back panels, raised both and sewed them together at the shoulders. I used the all in one facing how to (very helpful!). I chose a fabric that drapes well and added a weaved ribbon at the neckline and under the bust. It can be worn with the weaved ribbon like a belt at the waist line or without it. Materials: sheer black veil with velvet flowers surrounded by silver glitter lined with smooth white lycra (hemmed with lace) and a weave for the belt. I still have to take a marco photo of the finish at the neckline. I have hand sewn the weaved ribbon at the neckline to hide the white lining from showing. The armholes are finished with a topstitch that keeps the lining in place. I really like the lace hem on the lining, it shows through the sheer overlay fabric while sitting down. 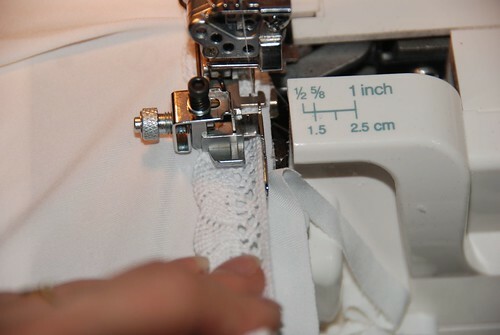 I have used the lace or blindstitch attachment foot with a flatlock stitch on the server to overcast the lycra lining and attach the lace in one step. The lace is placed rights sides facing over the lycra. The blade cuts the edge off lycra, the raw edge is overcast and the needle stitches just barely through the edge of the lace. 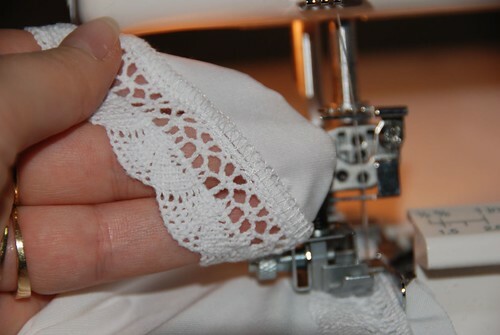 Then turn the lace and pull slightly, the vertical bars from the flatlock will show on the eright side, a nice flat stitch is on the backside. Thank you for the Malissa pattern. I will sew it again and now my head is filled with many alteration ideas for it: as a top, as a beach dress, with a crochet neckline like Alison’s dresses, with a gather instead of pleats, with really short sleeves, oh the possibilities! Can’t wait to see what everyone else creates! Did I mention these awesome videos on sewing machine feet? On the left side in the Main Menu there is alike Free sewing videos, it takes you to a list of videos on so many sewing machine feet, I didn’t even know they exist. 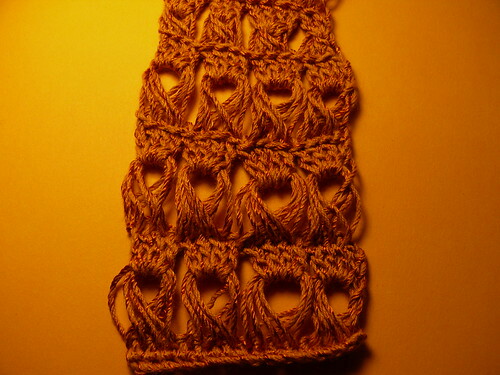 Silk Slip – Knitting Lingerie Style, originally uploaded by fmirela. 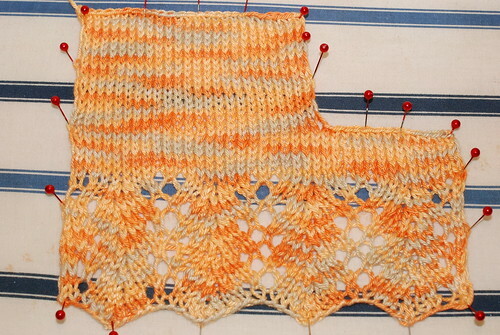 This is what the lace section from the Silk Slip looks like, after all that studying on combo knitting and slanting decreases. 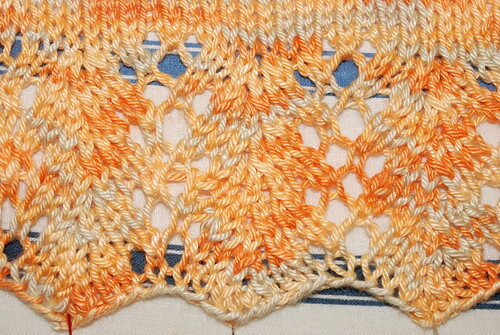 I guess it is pretty close to the pictures in the book, I wish I did not knit all 4 repeats of the pattern, but I’m quite ok with it as a first hand knit lace work. Both my cups are finished and waiting to dry on the ironing board. I have found the right interfacing for it, although I’m still wondering how that is going to feel directly on the skin, especially in that sensitive area…I have found it at JoAnns. 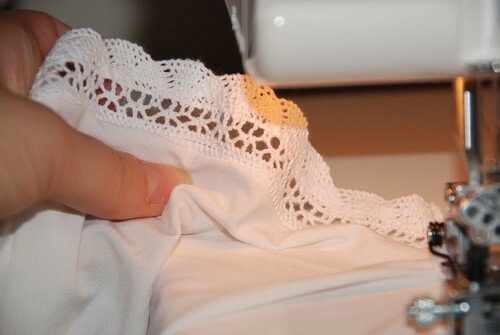 It is a sheer jersey Pellon interfacing that can be applied by steaming only without pressing, and it is transparent enough so that it does not show through the knit work. I’m casting on the midriff! 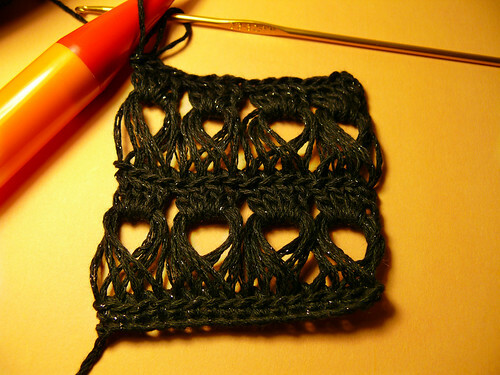 My samples of the Broomstick Lace Crochet.